Business sentiment moving into the first quarter of 2017 remains high, with Dun and Bradstreet’s November Business Expectations Survey indicating increased expectations for sales, employment, profits, capital investment and selling prices compared to the previous quarter. 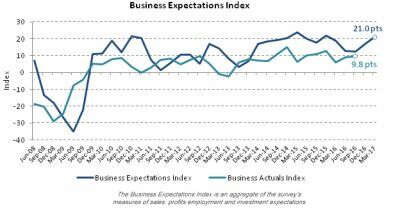 Dun & Bradstreet’s Business Expectations Index, the average of the survey’s measures of Sales, Profits, Employment and Capital Investment, stands at 21.0 points for the March quarter of 2017, up 23.5 percent from 17.0 points for Q4 2016 and 11.1 percent from 18.9 points in March 2016. The interim Q1 2017 result is 12.4 points above the 10-year average of 8.6 points. The index is currently at its highest point since the December quarter of 2015, when it reached 21.8 points. “It appears that the business sector is responding to the positive effects of record low interest rates, a still-favourable global economic environment, including the recent lift in commodity prices, and ongoing momentum from exports, construction and services,” Mr Koukoulas added. Bucking a recent trend seen in the survey, plans for capital investment in Q1 2017 have increased, with the Capital Investment Expectations Index at 13.5 points, up 70.9 percent from 7.9 points in Q4 2017 and 7.1 percent higher than the 12.6 points recorded at the same time a year earlier. Some 19.6 percent of businesses expect to increase capital investment in Q1 2017 compared to the previous corresponding quarter, while 6.1 percent of businesses plan to decrease capital investment. Of the seven industries surveyed, Retail was the only industry expecting lower capital investment in the March quarter of 2017. Its individual Capital Investment Expectations Index was 5.5 points, down from 5.9 points in the December quarter and 15.0 points at the same time a year earlier. For the March quarter 2017, 13.7 percent of retailers expect to increase capital spending while 8.1 percent expect to decrease capital spending. Expectations for profits were also strong, with the Profit Expectations Index up 38.0 percent from 17.1 points in the December quarter to 23.6 points for the March quarter. Since the previous corresponding quarter, profit expectations are up 27.9 percent from 18.5 points. The Profit Expectations Index is currently at a two-year high, reaching its highest point since hitting 25.9 points in Q1 2015. “Low interest rates and contained cost pressures from low wages growth are likely to be factors feeding into this positive profit outlook,” Mr Koukoulas noted. Construction was the only industry with lower profit expectations for the March quarter 2017 compared to the December quarter 2016: its Profit Expectations Index fell 54.1 percent from 14.4 point to 6.6 points. 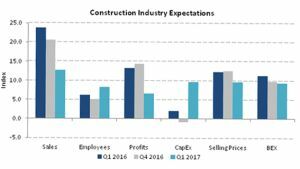 In general, the Construction industry had one of the more subdued outlooks for the first quarter of 2017. It was also the only industry with a lower Selling Prices Expectations Index for Q1 2017 compared to Q4 2016. In addition, Construction companies flagged lower sales expectations for the coming quarter (12.7 points, down from 20.6 points). Of all seven industries, Construction was the only one with a lower Business Expectations Index for Q1 2017 compared to Q4 2016, slipping from 9.8 points to 9.3 points. “The level of business expectations remains consistent with the economy growing at a 3 percent pace – perhaps a little higher. The generally positive outlook for the economy is one reason why the Reserve Bank is likely to leave interest rates on hold for the next few months and then judge whether the positive news on the economy has been sustained,” Mr Koukoulas said. “This is especially the case with the rise in expected selling prices, which tends to pre-empt an upturn in inflation,” he added. The Selling Prices Expectations Index was at 14.4 points, up from 9.3 points in the previous quarter but down slightly from 15.1 points in the March quarter of 2016. All industries except Construction expect to see an increase in Selling Prices. The outlook for employment is also positive: the Employment Expectations Index rose from 13.0 points in the December quarter of 2016 to 15.8 points for the March quarter of 2017. However, the Manufacturing and Services sectors saw a decline in their Employment Expectations Indices in Q1 2017 compared to Q4 2016. Businesses reported higher actual sales, employment, profits, selling price and capital investment the September quarter of 2016 compared to the same time a year earlier. The Business Actuals Index stands at 9.8 points for the September quarter, compared to 8.9 points in the June quarter 2016. Retail, Construction and Services businesses saw slight declines in business activity in the September quarter compared to the June quarter of 2016. However, the current Business Actuals Index is slightly down from the September quarter 2015 (11.0 points). Compared to the September quarter of 2015, only Manufacturing, Retail and Transport, Communications & Utilities businesses reported higher business activity. ‘Weak demand for products and services’ continues to be the biggest perceived threat to growth in 2017, with 19.08 percent of companies identifying this as the greatest barrier to growing their businesses. Manufacturers were particularly concerned about this factor, with 37.3 percent identifying it as the biggest barrier to growth, while Transport, Communications & Utilities companies were least concerned at 11.9%. In this industry, ‘online selling by competitors’ was seen as the biggest threat. Meanwhile, ‘consumer confidence’ was seen as the factor most likely to influence business operations in the coming quarter, with 40.9 percent of companies returning this response. This was the top answer for all industries. While businesses appear optimistic moving into the first quarter of 2017, the general outlook for the year as a whole is less clear. The percentage of businesses that say they are more optimistic about business growth next year compared to this year is at a three-year low: in November, 50.2 percent of all firms said they are more optimistic, down from 63.4 percent in October, and down from a 36-month average of 62.6 percent. The current figure is the lowest result since October 2013 (when 35.8 percent said they were more optimistic). 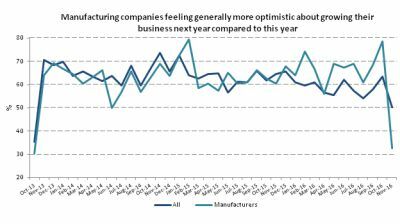 In particular, optimism among Manufacturers slumped dramatically in November 2016, with the percentage of respondents feeling more optimistic about growth in 2017 compared to 2016 diving from 78.7 in October (the highest score across all industries) to 32.8 in November (the lowest score across all industries).